Now a Netflix series, the best-selling graphic novels return--with the original creators! 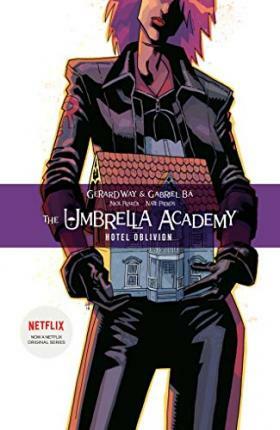 Gerard Way (My Chemical Romance, Doom Patrol) and Gabriel Bá (Two Brothers, Casanova) have earned awards and accolades on their separate projects, and finally return to their breakout 2007 hit, for the latest chapter in the bizarre lives of their former teen superhero team. Faced with an increasing number of lunatics with superpowers eager to fight his own wunderkind brood, Sir Reginald Hargreeves developed the ultimate solution ... Now, just a few years after Hargreeves's death, his Umbrella Academy is scattered. Number Five is a hired gun, Kraken is stalking big game, Rumor is dealing with the wreckage of her marriage, an out-of-shape Spaceboy runs around the streets of Tokyo, Vanya continues her physical therapy after being shot in the head--and no one wants to even talk about what Séance is up to ... The award-winning and best-selling superhero series returns, stranger than ever--And their past is coming back to hunt them.